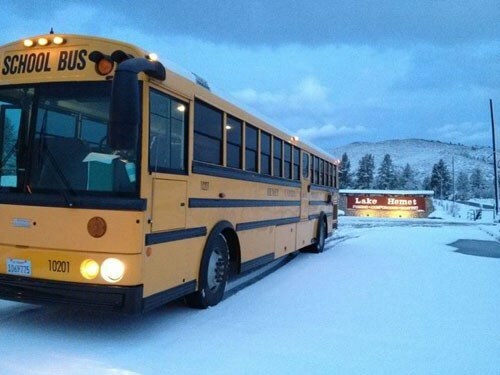 Hemet Unified School District provides regular and special education transportation for the communities of Hemet, Winchester, Anza, Aguanga, Idyllwild, Pine Cove, Green Acres and parts of San Jacinto and French Valley. The District encompasses over 750 square miles with elevations ranging from 1,500 to 10,800 feet and operates on a $14,160,000.00 budget. The Hemet Unified School District Transportation Department also provides complete transportation services for the San Jacinto Unified School District, Perris Union High School District, Perris Elementary School District, Romoland School District and special education transportation services for Nuview Union School District, the San Bernardino County Superintendent of Schools in the High Desert with locations in Riverside, San Bernardino, Los Angeles and Sacramento Counties. The Transportation Department also has a contract with the California Department of Education to provide residential transportation services on Fridays and Sundays for the California School for the Deaf, Riverside. The Transportation Department utilizes a state-of-the-art routing system which successfully allows the Hemet Unified School District to provide a regional transportation service to our customers in lieu of a unilateral service. This coordinated regional approach allows our partner districts to combine resources and reap the benefits of size and scale. In the 2010 – 2011 school year, the Transportation Department's 203 employees safely operated 210 school buses which traveled 3,491,746 miles. This mileage equates to 140 trips around the world or over 7 round trips to the moon! The Transportation Department operated 137 routes comprised of 1,289 runs, servicing 8,364 stops and covering 17,546 miles on a daily basis. 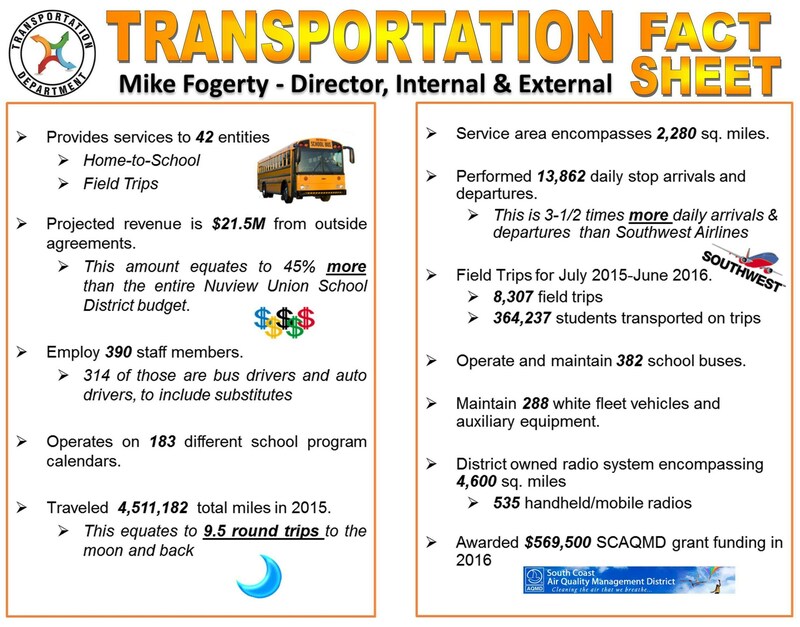 In addition, the Transportation Department successfully performed over 5,000 activity trips. The Governing Board of the Hemet Unified School District is very supportive of the Transportation Department. This support has also enabled the Transportation Department to acquire 53 clean burning CNG buses, many of which replaced older diesel buses. In 2008, construction was completed on our CNG fueling station which allows the Transportation Department to fuel the CNG buses on site. The Transportation Department boasts three (3) full time State Certified Driver Instructors and eight (8) State Certified Behind the Wheel Trainers. Every bus driver is required to demonstrate proficiency annually. This commitment to excellence is reflected in the safety conscious drivers employed in the Transportation Department. Additionally, the Transportation Department has eleven (11) full time mechanics and one (1) Vehicle Maintenance Supervisor whose combined experience exceeds 160 years. The Transportation Department provides maintenance on all of the school buses and the entire support vehicle fleet which is comprised of vehicles ranging from golf carts to commercial food service trucks. "We strive to be the most unique and innovative public school transportation department in California through our relentless pursuit to exceed standards of safety, efficiency and customer service. We aim to be progressive in our relationships with current and potential partner districts in order to develop and sustain partnerships that exemplify cost effectiveness and provide proactive service."